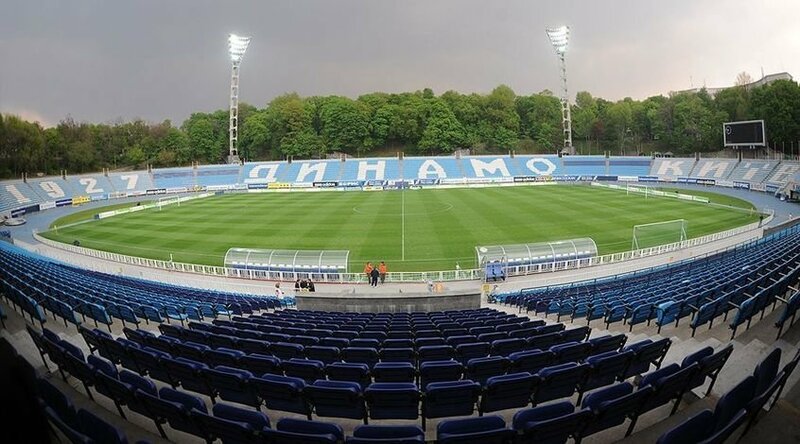 Dynamo Stadium (Dinamo Stadium named after VV Lobanovsky) is the home arena of FC Dynamo (Kyiv). Also in the stadium temporarily plays Donetsk "Olympic". It is located near the metro station Maidan Nezalezhnosti. In the premises of the central tribune there is a three-storey office of LLC "FC Dynamo" (Kiev) "and almost all of its services. In 2001, the stadium opened a fitness center with a swimming pool. On the territory of the stadium there is a monument in honor of the football players of Kiev Dynamo, who died during the Great Patriotic War, including the participants in the Match of Death. FC "Arsenal" - FC "Desna"
A small (16,873 seats) but nice stadium. Watched UEFA Women's Champions League Final here, was very well organized. Lacking toilets in the surrounding area though. Legendary FC Dynamo Kyiv arena. Convenient location. No weather shelter, limited parking. It is old stadium but atmosphere is good and is is surrounded by Forrest or park which makes this place special. Stadium is small comparing to modern arenas but it is still nice to be there if the stages are full. Be prepared to wait in long queues for beer during half break. Children and youth sports school of Olympic reserve on the rowing "Burevestnik"